Hi bento pals! Today I tried out a trick that I first discovered through notabrownbag's website. It's portable miso soup! You can buy powdered miso soup packets, and I think I may even have one hiding in one of my desk drawers, but there is nothing like fresh miso paste and delicious cubes of tofu. Today even turned out kind of chilly with a few drizzles, so it's a perfect day for miso soup. 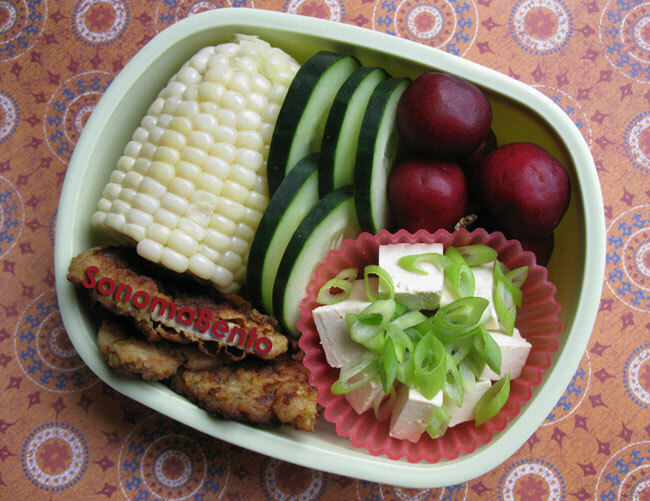 In this bento: steamed white corn, cucumber slices, cherries, my portable miso soup, and breaded pork cutlets leftover from last night's dinner. Portable miso soup is super easy: in the silicone cupcake liner I have a ball of miso paste mixed with a pinch of dashi granules, topped with cubes of tofu and sliced scallions. Dump the all of those ingredients into a bowl and top with hot water. Et voila: Miso Soup! Note: I have tried making miso soup without dashi, and it just is kind of flat tasting. I found dashi granules at Asia Mart on Guerneville Road in Santa Rosa. It's totally worth it if you are making miso soup at home. Dashi indeed makes miso soup much tastier...! I love the idea of portable miso soup :)!! I've had some powdered miso pouch packets from Cost Plus World Market that I thought were pretty good without extra seasoning; can't remember the brand. Thanks Cooking Gallery! Dashi adds such a wonderful layer to miso soup. You should definitely try the portable version. Hmmm, I will have to search that out. Thanks for the tip, dragonmamma! All of these look absolutely DELICIOUS!! !